A man arrested after five mosques had their windows smashed has been detained under the Mental Health Act. The 34-year-old, from Perry Barr, handed himself into a police station on Friday, police said. 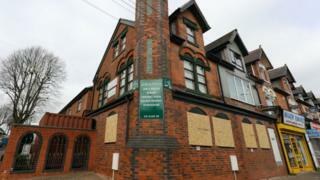 The five mosques in Birmingham were attacked early on Thursday. "At this stage police are not seeking anyone else in relation to these five incidents," the force said. Officers do not believe he was part of an organised group. West Midlands Police said it was continuing to investigate the attacks on the five mosques which happened between 01:25 BST and 03:15 GMT. West Midlands Assistant Chief Constable Matt Ward said: "We continue to work in partnership with mosques and local communities around the West Midlands. A 38-year-old man who was detained by members of the community has been released without charged and ruled out of the inquiry, police added.